Brent Young is a 54-year-old Gideon from Warsaw, Missouri. Like many of his fellow Gideons, he enjoys watching people come to Christ, handing out the Word of God, and hearing testimonies of how God is changing lives around the world. However, Young’s ministry is unique in one way—he operates from the saddle of a red Trek bicycle. In 2012, Brent Young decided it was time to start over. He had been an alcoholic, a drug addict, and bound by the desires of the world. God pursued him, and he knew he had to stop running. In fact, he knew God was calling him to start riding. “This is not my first ride. The first ride I did was a thousand miles, and my second ride was over 2,500 miles,” says Young. 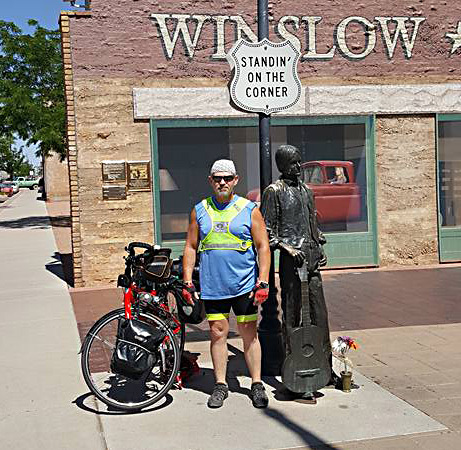 He is now on his third tour across the USA, currently pedaling through mile 1,240 in Winslow, Arizona. The Gideons in his home camp back in Missouri have not seen him in quite some time. However, Young is still meeting with Gideons for prayer and encouragement in the towns he rides through. “I feel like part of a big family when I meet with Gideons across different states,” he says, “They hug me and recharge my spirit to continue spreading the Gospel.” Gideons along his journey often pray over him and replenish his saddle bag with New Testaments to share with those he meets on the road. So far, Young has biked through 17 states and placed copies of God’s Word into around 300 hands. Dan is one of the many people Young had an opportunity to share the Gospel with. While resting at a traffic corner in Albuquerque, New Mexico, Dan asked Young why he was riding. Young replied simply that he was spreading the Word of Jesus and handing out Scriptures. Without missing a beat, Dan asked for a copy, and Young was able to give him a New Testament and witness to him. “It was the best part of my day,” said Young. The road is not always easy. In fact, riding with the buzzing sound of semi-trucks speeding by, going against the wind, through heat and exhaustion—these are common struggles Young faces on a typical day’s ride. However, the heaviest burden he experiences is seeing the spiritual drought most people live in. Lord willing, Young plans to continue his ride to California before heading home. You can pray with us for his safety on the road, as well as his strength spiritually, as he witnesses to those he meets. I am a Gideon from Malaysia. I will keep you in my prayers for safe journey mercy as you cycle to spread the Living Word of God among those who have yet to know our Lord Jesus Christ. PTL. Praise The Lord for how He is using Young men to reach His people. Praise the Lord! Our God is Great! May our God bless our brother in Christ and keep him safe on his journey. God send your Holy Spirit into all the hearts and lives that Brent touches today and for all the days that you see fit for our brother to continue in this mission. Sawadee from Thailand! Reaching out from Cali Brent. God bless you on your pursuits of spreading God’s word. The power of God flows through you in many ways that we are unable to see, and the spirit has strengthened your faith abundantly. In Christ with love brother, stay strong.